Bringing together elements of elegance and excellence, the Longines Record automatic models will allow you to enjoy truly timeless aesthetics and outstanding functionality that will always stand the test of time. Wonderfully timeless in every sense, this Longines Record Men’s Watch is perfect for every occasion. 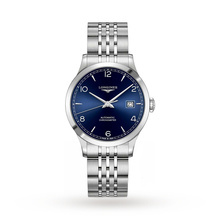 Boasting a stainless steel case and bracelet, a striking blue dial, a date display at three o’clock and a scratch-resistant sapphire glass, this handsome timepiece is also powered by an automatic movement to achieve optimum performance.